Hurricane Maria?has intensified into a ?potentially catastrophic? category five storm as it continues on a collision course with British overseas territories already battered by?Irma. The US National Hurricane Centre (NHC) said the hurricane, which has recorded winds of more than 160 mph, is likely to remain ?extremely dangerous? when it approaches the?British Virgin Islands?(BVI). 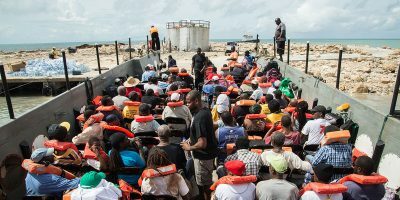 Emergency steps are being undertaken on the BVI to prepare for the looming onslaught, although an official coordinating the operation has warned the islands had been ?weakened? by Irma and the situation ?doesn’t look good?. Relief workers are racing to secure debris left strewn across the islands that have the potential to make the coming hurricane ?more hazardous? if they are picked up by high winds. Another British overseas territory,?Montserrat, has been issued with a hurricane warning amid fears Maria could bring a devastating storm surge, while torrential rain could trigger deadly flash floods. UK International Development Secretary,?Priti Patel, said the Government is under no illusion about the possible impact of the strengthening hurricane and said they are taking steps to prepare communities. The Foreign and Commonwealth Office is advising against all travel to the BVI, warning residents to identify shelter ?immediately? and be ready to take cover when the hurricane approaches. Following a similar path to Irma, Maria’s ?intense? centre made landfall with Dominica on Monday and the hurricane is expected to reach the British Virgin Islands on Tuesday night and into Wednesday. Brigadier John Ridge, the second in command of the UK’s Joint Task Force, said whichever direction the hurricane goes, ?it is bad?. ?They are either going to get the wind, which will pick up all the debris that is lying around,? he said. ?And also, irritatingly, where they have made progress in getting covers over the houses and power lines up, it will potentially damage that again. ?Or they get a huge amount of rain, which is also bad because of the blockages in the drainage channels – so the potential for some quite serious flooding as well. ?Whatever happens, it doesn’t look good sadly.? Foreign Office officials have also warned against all but essential travel to Montserrat, where residents voiced concerns that the hurricane will strike the island from the south, creating a ?very serious? situation. Boeing cutting production rate of 737 Max jet.